In 2016, while working on a re-translation of a Sumerian literary text, I came across this image on the Cuneiform Digital Library Initiative website. 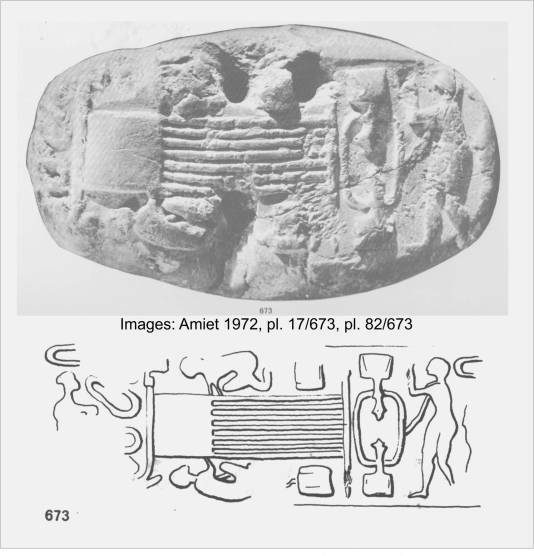 It was apparent to me that the multiple imprints on this clay tablet were strikingly reminiscent of the T-shaped pillars of Göbekli Tepe.i I decided to present my theory to Graham Hancock, who found it sufficiently interesting to post on his blog. More recently, while trawling the internet for new photos of the excavations at the site of Göbekli Tepe, I came across this blog post, on the Tepe Telegrams website. The author, an archaeologist working at the site in 2017, reacts to my interpretation of the image on that tablet. I take this to mean that my “false interpretation” could have been prevented if I had acted less impulsively, taking the time to fully digest and accept the official explanation of the image. That, in turn, strongly implies that archaeologists have no problem comprehensively interpreting such findings. We shall see. Graham Hancock does not make any such bold assertion. He proposes that the image is “deeply puzzling” and “appears to show one or more oval enclosures of the Göbekli Tepe type”. I do agree that a critical examination of evidence is always a good idea, whether “doing” science or art history, the main subject of my degree. “But who cares?” I care. Graham Hancock cares. A lot of people care about our common history and the truth of it. The author continues to build their case on the implication that certain absolute claims as to “round buildings” have been made on impulse, unaccompanied by intelligent thought process. I challenge them to provide clear evidence of this implication, instead of stooping to the realm of imprecise offence. The author also suggests that the image is not particularly reminiscent of Göbekli Tepe. I would be interested to know how they would go about creating a ‘perfect abstract depiction’ of that singular place. Its most iconic elements, the two central pillars, and the overall shape of the place would, in my view, be among the most obvious candidates. The author is referring to the fact that there was originally a seated figure to the right of the T-shaped image where the tablet has been damaged. For him, the presence of this figure means that the overall symbol is proven to have nothing to do with Göbekli Tepe. It is a straightforward weaving scene. The figure is a weaver. 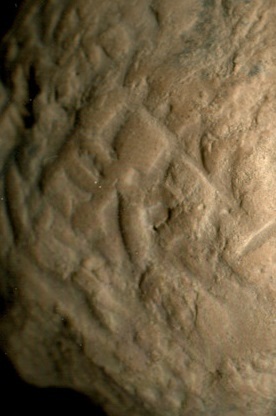 I have found another example of the same T-shaped image, this time in a less fragmented condition on a completely different type of clay artefact. This one is a bulla, and shown on CDLI under reference P254193.ii Bullas are hollow balls of clay containing small counters, and are designated as pre-writing, ca. 8000 to 3500 BCE. They are thought to have been used for trading. In the photo below, we can see a seemingly squatted figure to the right of the pillar, with one hand touching it. An animal can also be seen there in profile, with its paws firmly planted just above. The animal is close enough to suggest they are part of the same stamp. 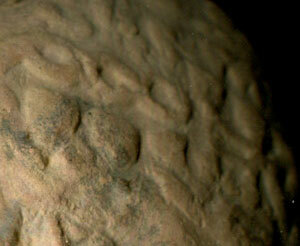 Planting two different stamps side by side into the moist clay would likely not leave such a neat impression. Since there is no writing on the tablet that might otherwise indicate a correct way of looking at it, see the bulla here above for a more convincing take on the correct perspective for the T-shapes. QUOTE …There is an indication of some more depictions that are hard to identify on the b&w photograph. That is why finds were and mostly still are drawn in archaeology, and in any case described extensively. And where to find a drawing and description of the find? In MDP 43 of course. I perfectly understand that this is the point at which those with a general interest in archaeology and browsing through an online database might be lost. MDP refers to the series “Mémoires de la Délégation Archéologique en Iran”. Why the “P”? Because the series was first called “Mémoires de la Délegation en Perse” and the abbreviation never changed. 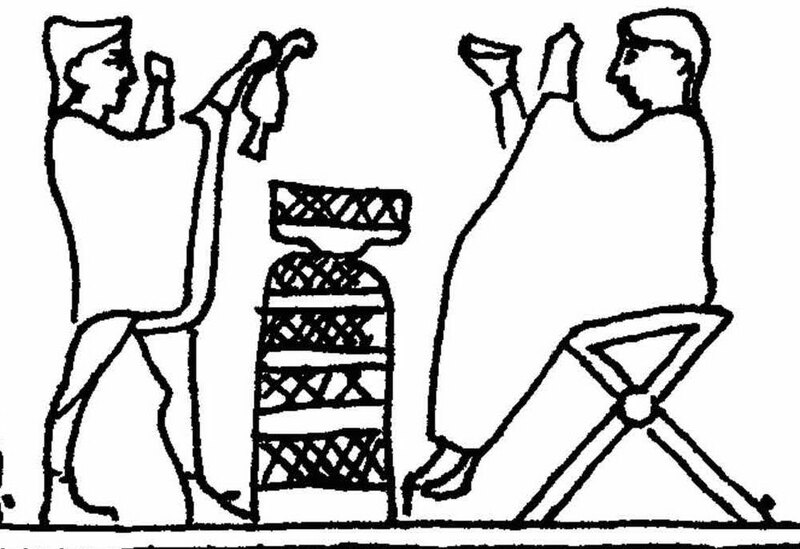 If we look the find up in volume 43 of this series, written by Pierre Amiet and dealing with “Glyptique Susienne”, the scene is described as “two figures sitting on the left, on curved seats, in front of apparatuses made up of two supports with square bases and an elongated oval element”. And the drawing of the sealing shows just that. The persons are touching this “oval element” with their hands. The publication has some more depictions of this kind on sealings, and at least some, such as MDP 43, nr. 673 or 674 are less fragmentary. It becomes immediately clear that we are not dealing with a depiction of T-shaped pillars, but of two supports with square feet at the bottom and a knob at the top, connected by an oval. I agree that the instrument is quite likely the same. This said, to my knowledge, there is no evidence of there having been any such weaving “apparatus” with just these two rectangular top or bottom-heavy ends. I point once again to the bulla, which also allows a comparison to our original tablet. I see the potential for a four-legged creature sat on top of–or underneath–an ordinary weaver’s loom as unlikely. I am more than happy to go along with the conclusion that the image is that of a loom. But I see it a simplification of both a practical tool and the cosmic loom. As above so below. In fact, in my book (The Story of Sukurru, a re-translation of one of the earliest literary texts) I build an argument for the possibility that stone circles represent the earthly version of the cosmic circle loom, where the T-shaped pillars are the pegs around which the cosmic Matriarch’s thread is woven. 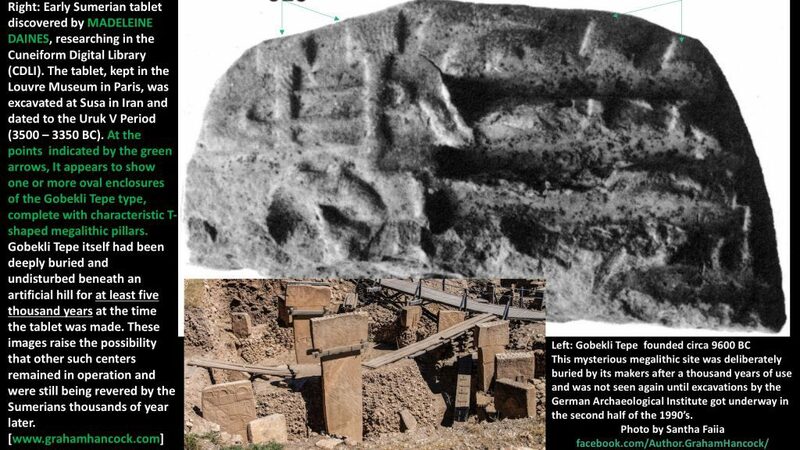 Yes, I had seen photos of Göbekli Tepe, and, yes, the similarity was immediately striking. It still is. The weaver’s circle (or round) loom with which I later associated the pillars was unknown to me then. I discovered the existence of this weaving instrument by means of my translation and interpretation of two collocated Sumerian symbols, LUM and GAM. LUM is the phonetic form of this symbol and the origin of our word loom. 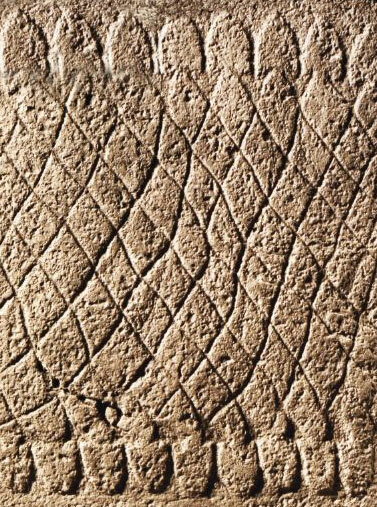 It is represented by what appears to be a pattern of stitches in the earliest pictographic form of the Sumerian language. GAM gave us the French word gamme, the scale or range. The symbols appear together on line 236, in a fragmented section of The Story of Sukurru, as: “on the circle loom a beautiful black feather to thread”. 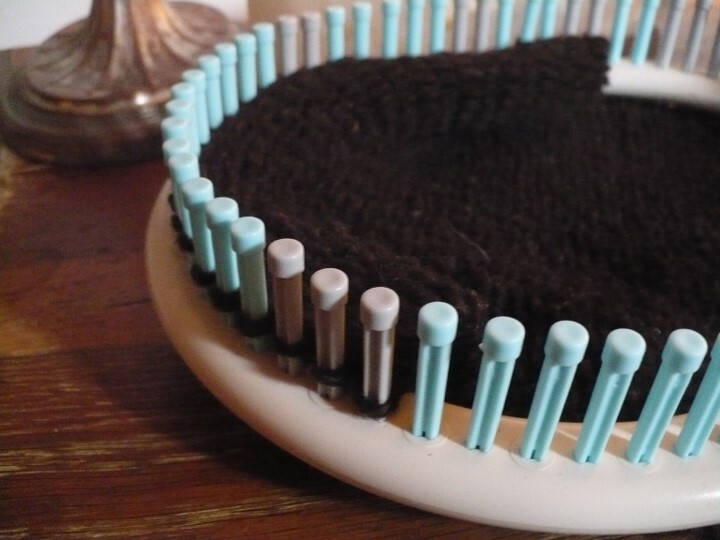 Pictured here below is a modern version of a hand-held loom with pegs. 1. General chronological and cultural-historic reasoning: What is the cultural background of the artefact I am looking at and how old is it? How likely might it be that the people making it depict an object or a site millennia older and not something well-known to them? If we choose to look beyond the confines of everyday activities, another interesting association can be made. See the bulla at another angle here. There is a weaving scene to the left of Pierre Amiet’s loom, but at the same spot on the bulla we find intertwined serpents.iii In The Story of Sukurru, I suggest that this well-attested serpent image is synonymous of the warp threads hanging from the cosmic Matriarch’s loom. 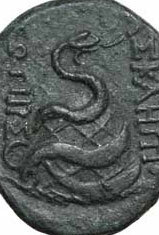 A bronze coin of Pergamon showing a serpent winding around the Omphalos of Delphi. 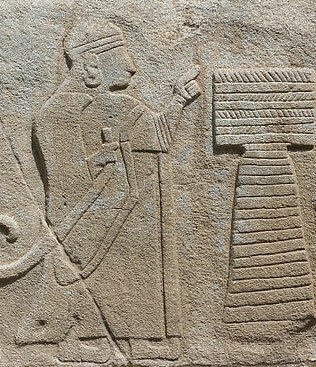 Detail on Göbekli Tepe Pillar 1, Enclosure A. Scene from the Inandik Vase, from the period of the Old Hittite Kingdom, c. 1600 BC. Reliefs on the orthostates at the west of the Sphinx Gate, Alaca Höyük, Turkey. 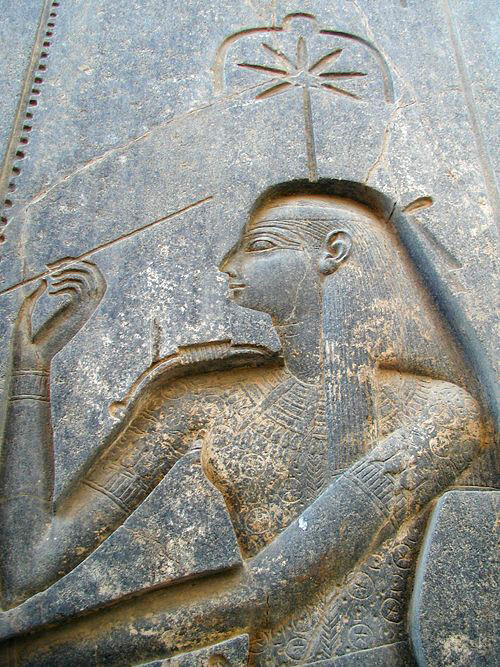 Seshat carved on the back of the throne of the seated statue of Rameses II in the Amun temple at Luxor, c. 1250 BCE. 3. Challenging the evidence / its documentation: Is the depiction fragmentary or hard to evaluate for other reasons? What kind of documentation is available to me? Does it allow me to fully comprehend what is depicted? Or do I need further information before I can make up my mind? 4. Go to the sources. Archaeological artefacts, or artefacts similar to the one at hand are usually published somewhere, and these publications may hold further information and better images. It may be tricky to identify the available sources. My theory of the cosmic circle loom derives from a long quest to understand the most ancient Sumerian symbols. When I began re-translating The Instructions of Shuruppak using an unorthodox monosyllabic method, it wasn’t for the pleasure of proving other people wrong. I was and am curious to discover the truth for myself. There is more to our history than first meets the eye. And there may be several layers of meaning underlying any symbol or image, as art historians well know. I believe that the memory of Göbekli Tepe was still alive in the people of Mesopotamia who first wrote stories in clay to preserve them. I don’t underestimate the earliest Sumerians, whoever they were. I daresay they were great weavers too. Look just below the T-shaped pillars on that first tablet. Is that a mouse peeping out of its hole? i Detail from clay tablet found at Susa, Uruk V period, ca 3500 to 3350 BCE, reference P281729, Cuneiform Digital Library Initiative (CDLI). ii Detail from bulla of uncertain provenience, ca 8500 to 3500 BCE, reference P254193, Cuneiform Digital Library Initiative (CDLI). iii Clay tablet found at Susa, Uruk V period, ca 3500 to 3350 BCE, reference P281728, Cuneiform Digital Library Initiative (CDLI). Wouldn’t it be great if Archeologists made a habit of reacting in this way, giving rise to a calm and rational debate, one that might actually result in a consensus or two completely logical and different opinions where they agree to disagree. This is sorely not the case in the last 150 years . The majority of mainstream archeology to anomalous finds, or finds that disrupt the current paradigm or official political doctrine of interpretation. have been condescending like the 1st paragraph, rife with personal attacks on the presenter and rarely actually addressing the question itself, let alone in a holistic manner. And in many cases dismissing the theory without reading the original article or visiting the site in question. This gave rise to the terms “armchair” and “windshield” or “windscreen” archeologists. Of course, archeology is not the only discipline where this type of unscientific, circle the wagons reaction is commonplace. But it is known for, at least in the past, refusing to use other sciences and technologies beyond the dust brush & screen strainer to determine a different or more expanded view. This is gladly changing with the varieties of technology available that can no longer be ignored but are actually used in locating sites and objects. A good wholesome, intelligent debate, free of (mostly)personal biases & academic polecisms. A few, brilliant witticisms or barbs can always enliven a sometimes boring exchange, if is done in a friendly manner. Mayhaps this will start a trend (not?). Kudos to all involved. That Human History is much too much older than the main liners ever can imagine! Two is that NO ONE, INCLUDING INDIAN HISTORIANS AND ARCHAEOLOGISTS, are looking at the ‘Unification Theory of Human Civilization’ at all! Three: India, as per our scriptures, History goes back 4.8 million years approximately! AND what the world, both sides of Historians, main liners as also people like Graham Hancock, are not taking into this factor in their Researches! This, in spite of Hancock himself having discovered submerged 2 sites off Indian coast over 10,000 years old!!!!!! I will just like to say one thing to all interested in our Ancient begiNnings. that, If One wants to unravel the Mysteries of our Ancient Past; Then consider the ‘EAST’ as INDIA and CHINA!!! The middle east for all the amount of Billion of $$$$$$ pumped in on research there; WILL NEVER EVER LEAD anyone near the TRUTH! WOW! Thanks for putting together this discussion. It amazes me how supposed scientists must start with the conclusion and try to adapt every finding to that conclusion or attempt to discredit the data before their eyes. The data, the finds, the dates, should weave the tapestry that is the story no conclusion they explorer wants to have it show. Closed minds reject facts, discard corner cases, and pretend rather than following the facts to the proper result. This is fascinating. A contemporary example of how we are indoctrinated to cringe at any new ideas that contradict what we are told is fact. It’s fantastic we have truly global communication now. We should really make the most of it before politics or disaster remove it. I just love to work in archaeology. but I am in wrong job. I am wasting my time. Is mainstream history right? Possibly/probably not but it is our best interpretation at this time. Are alternate theories of history right? Although they are not accepted by mainstream scientists there is nothing saying that they are wrong, unless fully proven wrong. Is the answer somewhere in the middle more than likely yes…..with symbols and languages that we know nothing about there can be multiple interpretations so we may never know the actual true meaning and the farther we go back in time the more there is a chance for error. By saying an idea is wrong because a previous idea was right is not good science, a good example of this is Columbus discovering the Americas. Although for many years it was argued that previous European civilizations may have or did make it to the Americas the mainstream would not budge because there was no proof. It is obviously now known that the Vikings and possibly other civilizations explored at least the coastal regions of North America. We must continue to question any theory no matter how “proven” it is, there is nothing wrong with that, all this will do is 1. give more credence to the proven theory by showing the new theory is not as strong, 2. show that the new theory is a better theory and that the old one was not perfect, or most likely, 3. although the new theory is not perfect it does show that parts of the accepted theory are also wrong and more research needs to be done on the topic if we want to get as close to the truth as we can. The people living in gobleki tepe was a race of giant people with 15′ to 18′ feet toll….